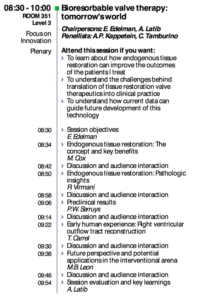 EuroPCR 2017 is the first leading cardiovascular meeting to host a plenary session dedicated to Endogenous Tissue Restoration (ETR). ‘Bioresorbable valve therapy: tomorrow’s world’ will explore how ETR can improve patient outcomes as well as the challenges behind translating the technology into clinical practice. The interactive session has attracted global thought leaders including Professor Martin Leon (Columbia University Medical Center/New York-Presbyterian Hospital) who will discuss the potential impact of this revolutionary approach to heart valve disease treatment. “This session recognizes the role of ETR restorative approach in the future of heart valve therapy. We are delighted by the high level of interest in the solution we are pioneering and are very eager to share the progress of our ongoing research. ETR is moving up the cardiovascular agenda,” said Xeltis CEO Laurent Grandidier. The session will take place on 17th May at 08:30 in Room 351 on Level 3 of the Palais des Congrès, Paris. EuroPCR is the official annual meeting of the European Association of Percutaneous Cardiovascular Interventions (EAPCI) and considered a world-leading course in interventional cardiovascular medicine. Over 12,000 participants are expected to attend this global forum for sharing; taking place from 16-19 May 2017.